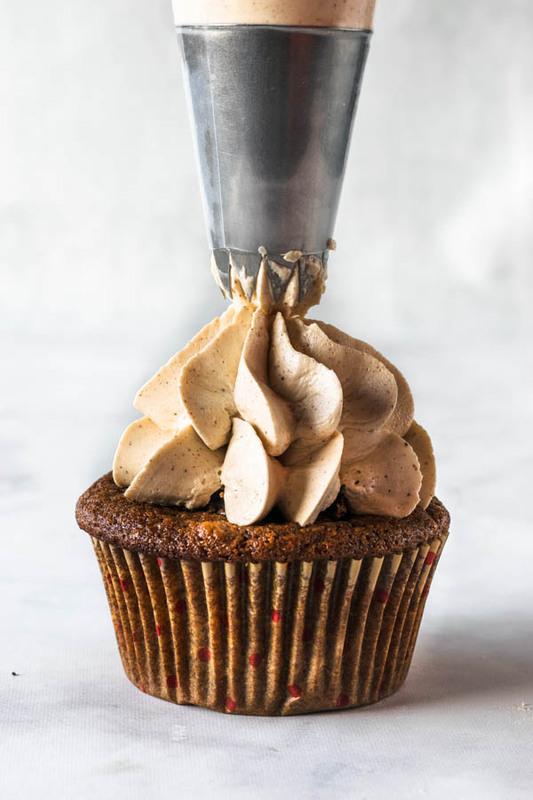 Today, I bring the most special and delicious cupcake recipe: Nutella Gingerbread Cupcakes! 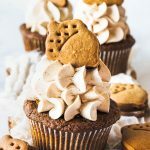 These Nutella Gingerbread Cupcakes are here today for a good reason, to celebrate the baking season with some other amazing bloggers. Marie from Sugar Salt Magic and Trang from Wild Wild Whisk organized this Christmas Treat collaboration with the theme gingerbread. Make sure to check out all of their Gingerbread Recipes. The links are down bellow. We start with these Nutella Gingerbread Cookie Sandwich. I got these super cute acorn cookie cutters on amazon. And thought I’d put them to good use. After baking, just place some nutella in a piping bag. 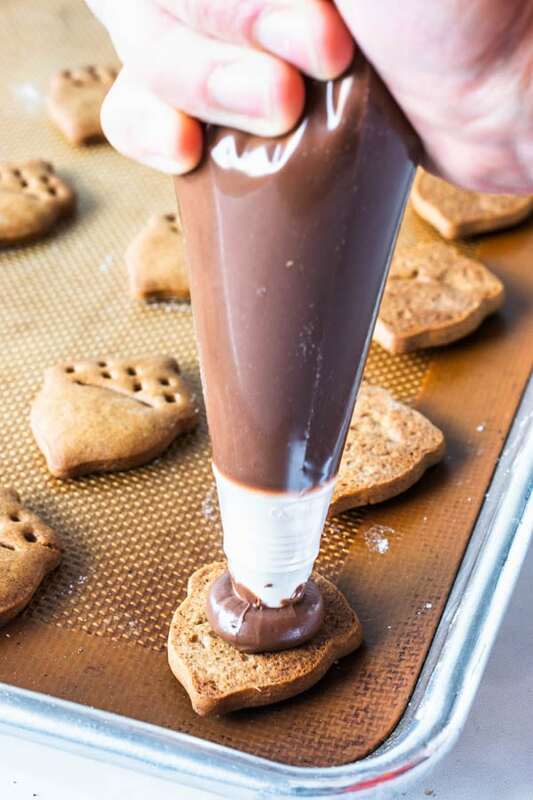 And fill your cookies, with as much nutella as your heart tells you to. Then place another cookie right on top. Ta-dam! That’s it. Doesn’t get any easier. 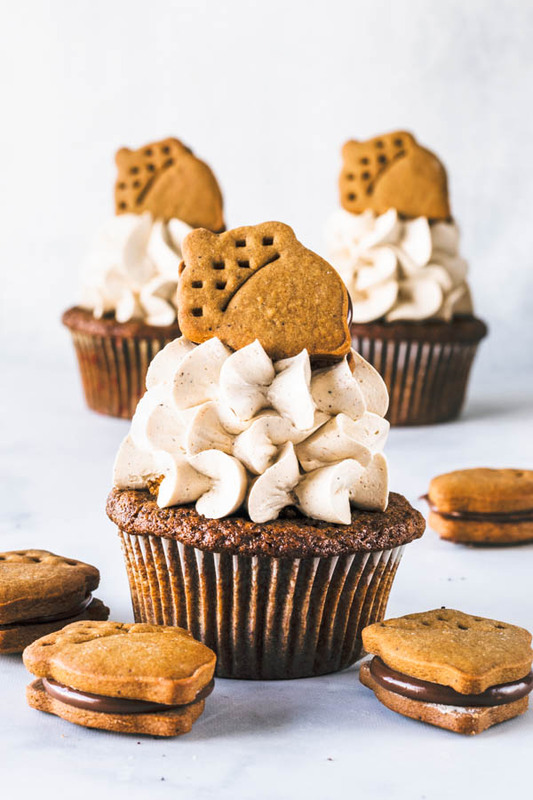 These are awesome treats on their own, but I really wanted to use them to top my Nutella Gingerbread Cupcakes, so they could take my cupcakes way over the top. 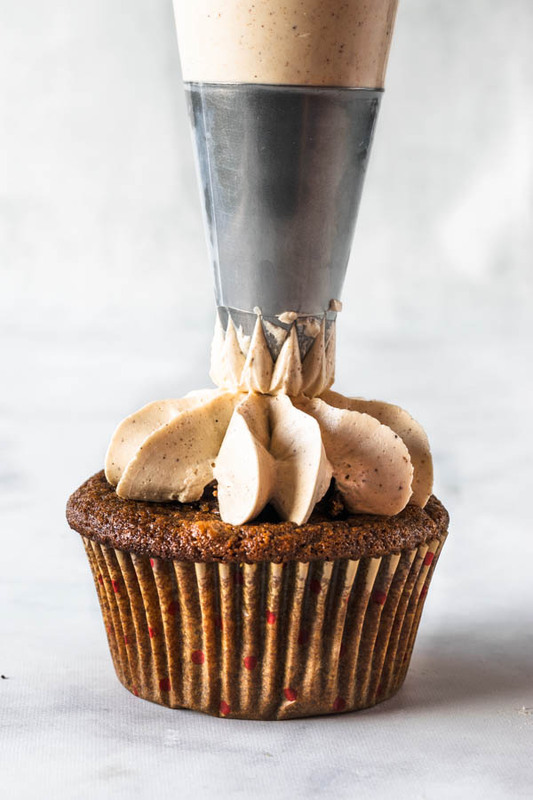 And I you know me, you know I like over the top cupcakes! 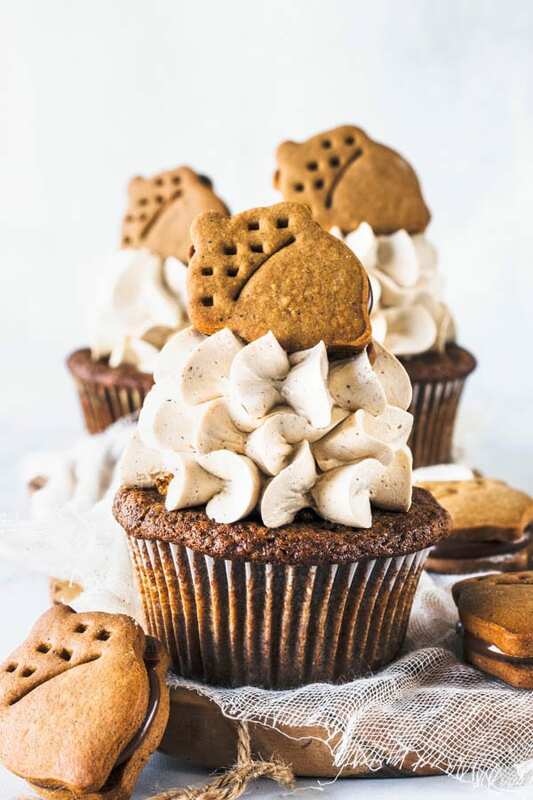 So, have I told you that these Nutella Gingerbread Cupcakes feature a gingerbread cupcake with a nutella filling? Check out this nutella goodness. Lately, I’ve been preferring homemade nutella, made vegan or paleo, out of wholesome ingredients like hazelnuts, maple syrup, etc. However, for these Nutella Gingerbread Cupcakes, I decided to go out all and get the nutella jar from the store. Because having store-bought nutella once a year really won’t kill anybody. If you want to ask me about the piping on top of the cupcakes, here’s a quick guide to what I did. I used a Ateco 829 tip. First, I piped a single star on top of the cupcake. Place the bag at a 90 degree angle over the cupcake. Gently press down, with low-medium pressure, for about 3 seconds, and release. You are looking to just pipe one single star like you see below. Now, place your piping bag again at a 90 degree angle on top of the first star you piped. And do the same thing. Press down for about 3 seconds, with low-medium pressure without moving the bag whatsoever. And then, you will do it on more time. And you will end up with 3 stars piped one on top of the other. Anyway, it’s really easy, try for yourself! 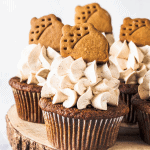 And right after piping the frosting on top of the cupcakes, I topped them with a Nutella Gingerbread Cookie Sandwich. 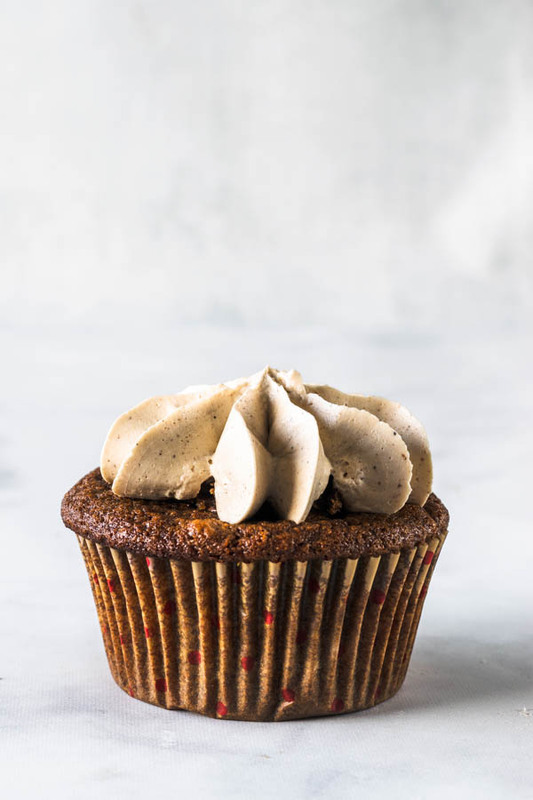 It was great that I got to share these Nutella Gingerbread cupcakes with my co-workers because if I kept them home, I would have devoured one or two more than I should. They were tempting and delicious. 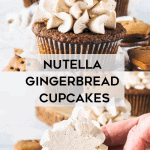 I hope you liked today’s recipe for my precious Nutella Gingerbread Cupcakes. And hopefully I could inspire you to do some holiday baking along with my friend’s and their recipes. 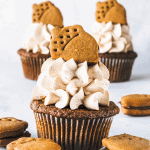 If you want to check out some more cupcake recipes, please visit my Cupcakes recipe collection. Trending right now: Creme Brûlée Pie, Chocolate and Dulce de Leche Cheesecake Pie, Lemon Macarons. Have a great day everyone, and thanks for stopping by! Pre-heat oven to 350F. Line a cupcake pan with paper cups. Sift flour, baking powder, baking soda, ginger, cinnamon, cloves, allspice, and salt together. Set aside. Cream butter with a mixer, at medium-high speed for about 1 minute. Add sugar and beat for another 2 minutes. Scrape sides of the bowl constantly. Add buttermilk to the bowl and mix until incorporated. Add dry ingredients and mix with a spatula. Bake for 15 to 20 minutes until done. Touch cupcake surface lightly with your finger and if it springs back, means the cupcake is done baking. Right before you start to make your buttercream, remove butter from the fridge. Cut it into thin slices, about 1/4 inch thick. Set aside. Place egg whites and brown sugar in the bowl of a stand mixer. I like to use my KitchenAid bowl. Prepare a double boiler, make sure the bottom of the mixer bowl won’t be in contact with the water in the double boiler. Over barely simmering water, whisk sugar and egg whites until they reach 140F, that’s a safe temperature for the egg whites to be consumed. Once whites and sugar have achieved this temperature, and sugar is completely melted, not leaving any granules behind, you may turn the heat off and move the bowl to the stand mixer. With the whisk attachment on, beat meringue until stiff peaks form. Once your meringue has reached stiff peaks, add the molasses. Mix until combined. Now start adding the butter, with the mixer on medium-high speed. Now you may also add the spices and mix until combined. If not, there are a few troubleshooting tricks you could try. Please refer to the post above for troubleshooting. Whisk flour, cinnamon, ginger, allspice, cloves, and salt in a bowl. Set aside. In a large bowl, cream butter for about 1 minute. Add sugar and cream for another 2 minutes. Now, add all dry ingredients. Mix with a spatula until incorporated. Form dough into a ball, cover with plastic wrap and refrigerate for at least 3 hours. Remove from the fridge. Cut into 4 pieces. Roll one piece out at a time on a floured surface until about 1/8” thick. Cut into the shape of your choice. 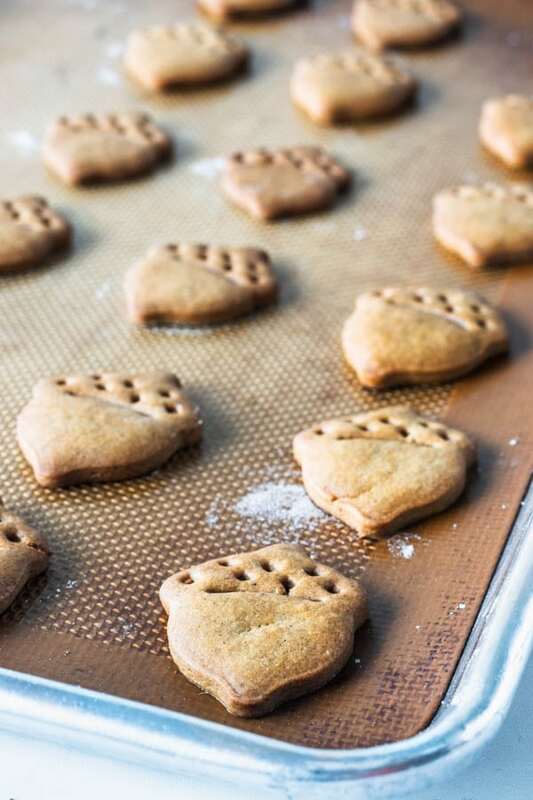 Place cut out cookies in a baking tray. Pre-heat oven to 350 and place tray in the freezer while the oven pre-heats. 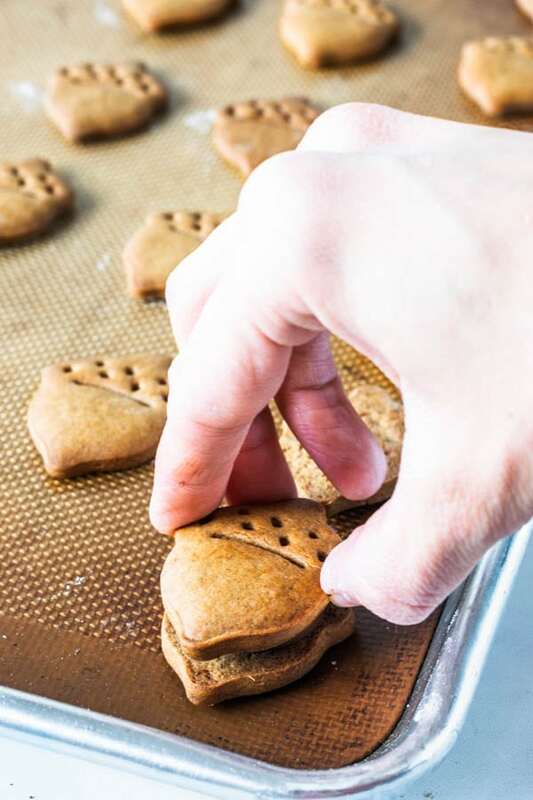 This will ensure that the cookies are cold, and the butter will be in a solid state and won’t start to melt as soon as it enters the oven. And it will give the gluten formation a chance to establish its structure before the fat melts. Bake for about 8-10 minutes, flipping in between if necessary. 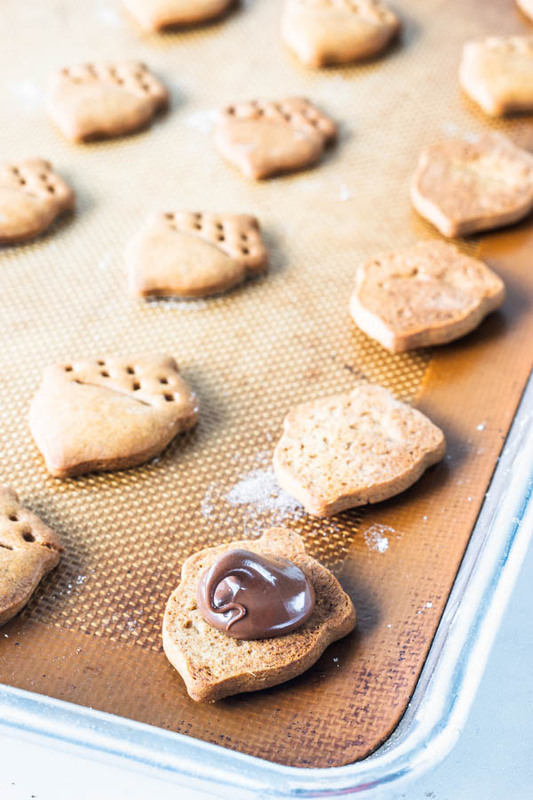 Let them cool before filling with the nutella. I used a piping bag filled with nutella to pipe it over the cookies as you can see on the post above. Cupcakes will last for about 4 days in the fridge, covered. Cookies will last for about 2 days at room temperature, and 4 days in the fridge, covered. 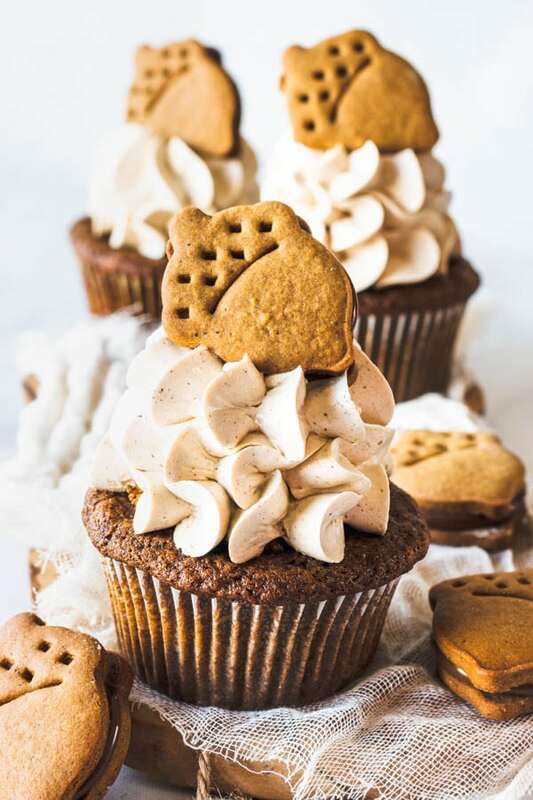 I love the idea of Nutella and gingerbread! What a perfect combo! Nothing beats a good cupcake and I have to say this is a Great cupcake!! Nutella and gingerbread belong together :-). 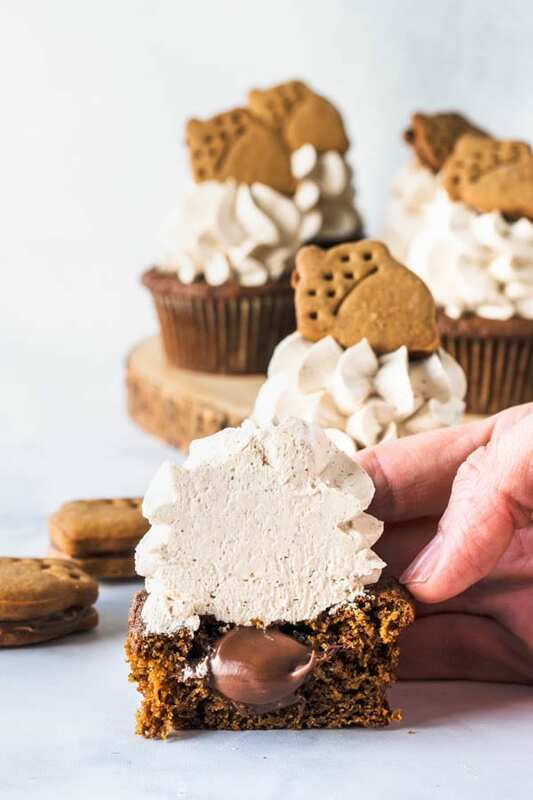 I love the piping technique you used. Take care. I personally don’t like Nutella(I know I’m crazy). Do you have a recommendation for something I can use in stead? Would cooled melted chocolate work? You could use chocolate ganache. Melt the same amount of chocolate and heavy cream together and let them come to room temperature before using. Thank you Lindsay! 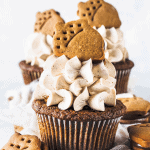 Great detailed recipe… and these cupcakes look quite scrumptious. I loved the pipping so much that I was about to ask which tip you used. I see that I have that one… I only have to pipe more them one layer up to get that effect. Yes!! Thank you so much Denise!! I appreciate your comment! 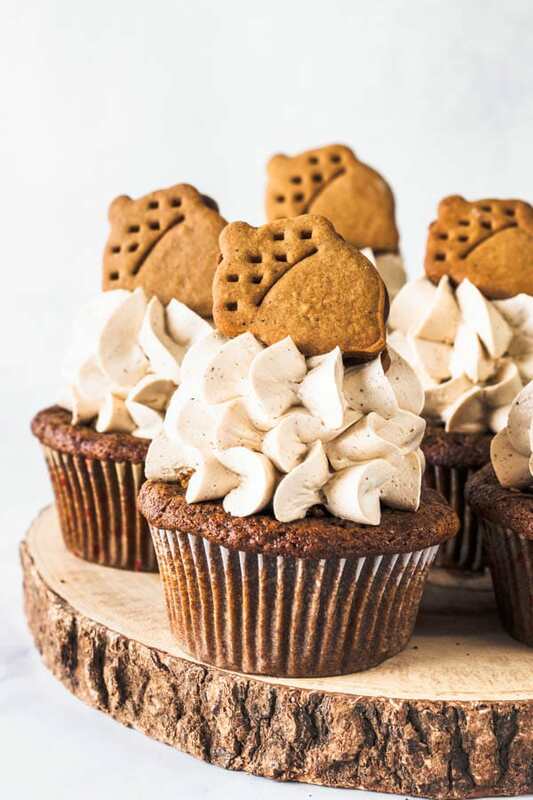 These look so insanely delicious! And I LOVE the gingerbread round up! Your photos are stunning! Thank you so much Kasey!